Whenever we feel like having hearty soup, there are same options cream of tomato, mushrooms or broccoli etc etc, well all these soups are loaded with heavy cream, cheese and fried croutons. After adding all this the soup somewhere we compromise its nutrition level. Try this soup recipe and you will not even think about all the fattening ingredients, because this soup will give you flavor, texture and taste without adding any thickening. 1. Heat oil in a soup pot, add spices, garlic, green chillis and onion and saute it for 2 min. Its not necessary to fully brown the onion its fine if they are translucent. 3. Once peas are cooked add 1/2 cup of water and let it come to boil. Once done switch off the flame and let it cool for 10 mins or till the time you can blend it. 4. Once cooled blend it into fine paste either with immersion blender or regular blender. 5. Once blended again turn it onto a soup pot and cook for 2 to 3 min. Now you can check on seasoning and consistency as per your taste. 6. Garnish it with fresh chopped corriender leaves and few drops of cream. 8. 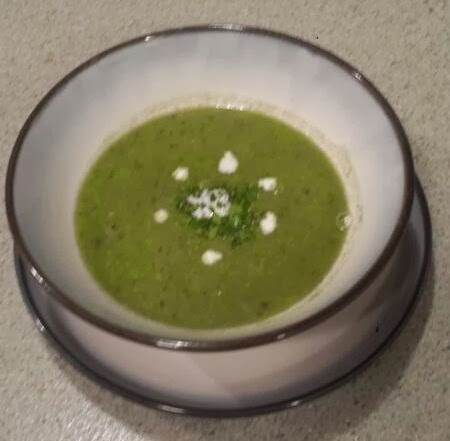 This soup will give you a naturally fresh green color and creamy texture, although this will taste on a sweeter side so you can add some dried herbs as well, lemon juice gives it a tangy taste.